If Dogs Run Free . . . If there isn’t a name for it, there should be: that feeling when you come back from vacation in a beautiful place and wonder why you don’t just live there. I know, this is a privileged person’s problem. Still, travel often leads people to question their daily lives and purpose, and I was having a severe case of that as I packed to return to Brooklyn after 5 days in the Dominican Republic in early March. Of course, I was very lucky to be able to go there at all, and to stumble upon the terrific Hotel Todo Blanco: a picture-perfect colonial style building perched on a hill above the ocean. Waking up there, I felt like a different person: fully relaxed, in both body and mind. In New York, I face winter mornings in the fog of a sinus headache and have to drag myself to the gym just to attain a modicum of sanity. In the D.R., I felt great from the moment I woke up and felt the cool ocean breeze wafting through our open patio door. Though I took long walks on the beach, swam in the ocean and hiked up to a terrific restaurant, El Cabito, perched on the edge of a cliff with a breathtaking view of the sunset, I never once “worked out” – there was nothing like work involved. It helped, of course, that I never turned on my cell phone or checked my e-mail. Nor did I read or hear any news for the 5 days I was there. (Turns out it doesn’t really change that much when you’re gone.) So why, I wondered, as I reluctantly packed my suitcase, do I choose to live in the harsh climate and dirty, noisy, costly city of New York, and keep a job that requires me to follow the news obsessively? Is this really a good idea? It’s not just the people in the D.R. 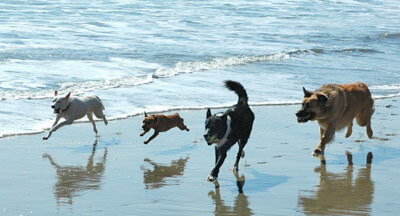 who are relaxed: dogs roam freely, on the beaches, in town, even in restaurants. No leashes (or neutering) required. And I never saw even one act aggressively. The D.R. seemed like heaven for all of us; I envied the European expats that live in the fishing village-turned-tourist town we stayed in. I even fantasized about buying the Hotel Todo Blanco and offering beach yoga and life coaching to my guests. Then we got in the taxi to the airport. I was surprised and a little flustered. “Thank you!” I said with a smile. As I headed for the taxi stand, though, I wondered: “making a difference? Do I really make any difference?” I’m not sure. In fact, I thought, if I owned a hotel in the D.R. and provided decent jobs and a living wage to people there, wouldn’t that be making more of a difference? Maybe I would even do volunteer work there, teaching English to children or something. Wouldn’t that help people more than I do now? I don’t really know the answer to those questions. But what I do know, and I felt as I headed to my office the next morning, is that, like many of us who put up with the discomforts and stresses of big cities, I have an opportunity now to do work that’s useful. Now that I’m back home, it’s where I need to focus. Advocating for better human rights policies may not provide anyone a living, but as I’ve written before, I do think advocates, working together, ultimately do an important service – even if it’s only to keep things from getting worse. Christof Heyns, the U.N. Special Rapporteur on Extrajudicial, Arbitrary or Summary Executions (a cheery title), made a similar point recently at a lecture at Columbia University law school that really struck me. He said that while the world seems pretty brutal today, it’s a whole lot better than before the Geneva Conventions, the cornerstone of international human rights law. In World Wars I and II, for example, the brutality of organized governments and their armies was unimaginable: some 60 million people were killed in the Second World War alone. Today, bombing the civilian centers of major cities would be unthinkable. Yes, there are brutal dictators who sometimes slaughter their own people, but it’s not on the same scale. Major world powers do not commit the level of atrocities seen in the past. New weapons have actually improved governments’ abilities to fight wars while killing fewer people. And the establishment of human rights laws and norms has made it impossible for those trends to reverse, even if we know that a superpower like the United States will never be held accountable for its own wrongdoings. The development of the law, pushed along slowly by its advocates, is gradual and often painfully slow, Heyns acknowledged, but it does shift norms and public understandings that eventually lead to lasting change. Of course, today’s challenges are still huge. As Rebecca Solnit recently wrote in a powerful essay in Harper’s, nation-states are less vicious today in attacks the built environment, but we’re steadily destroying what’s left of the natural one. That’s perhaps the fight where tangible gains seem most elusive: defending the planet’s climate and air and water requires long-term commitment to concerted and coordinated action despite huge political hurdles; it’s undoubtedly incredibly frustrating to everyone involved. So what does this have to do with why we don’t all just move to the D.R.? Maybe just that part of how many of us feel in any place will be directly connected to what we think we can contribute there. Maybe one day I’ll find a way to make what feels like a real contribution while living along a tropical beach lined with palm trees and cooled by ocean breezes. But for now, I live in Brooklyn, which has a lot of very different things to offer. And I think there’s plenty for me to at least try to contribute right here. This entry was posted in Advocacy, change, freedom, happiness, service and tagged advocacy, beach, Bob Dylan, Brooklyn, Caribbean, dogs, Dominican Republic, Hotel Todo Blanco, If Dogs Run Free, New York, service, travel, vacation, winter, yoga. Bookmark the permalink.